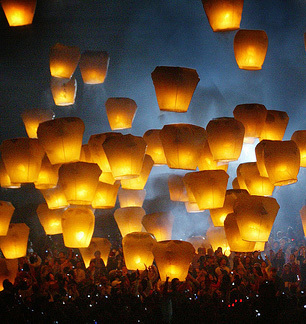 Chinese Floating Lanterns, also known as Sky Lanterns, will add an exciting new element to your party. Their sparkle can be seen flying up in the air for up to 20 minutes and will travel several miles in distance, after which the fuel cell (flame) will die out and they will gently float back down for a safe landing. Sky Lanterns will fly to more than 1,000 meters in altitude, providing an enjoyable yet amazingly simple show for all ages. Chinese Floating Lanterns are safe and easy to use. They are made of flame resistant paper, is 100% biodegradable and requires only minimal assembly. They are calm and quiet, and let you sit back and enjoy the show. Chinese Flying Lanterns are a great and simple way to entertain guests. Enjoy them a few at a time or create amazing displays by launching them in big groups to celebrate holidays, traditionally they are used for Chinese New Year. 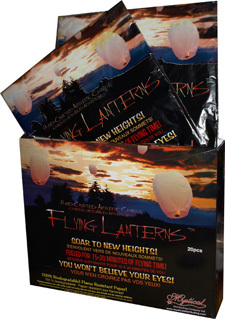 Chinese Floating Lanterns can be purchased in convenient packs of 3, 5, 10 and 20. 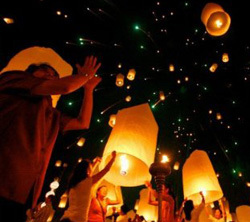 It allows everyone to easily participate in an elaborate firework flying lantern show with great effect. Simply let the air warm up inside for a couple of minutes and release! Dimensions D38cm x W60cm x H100cm. Weight 75 grams. All Chinese floating lanterns are supplied individually sealed in a water resistant envelope and packed in recycled cardboard outers, each individual lantern has lighting and safety instructions included.